Universal Pictures has entered negotiations with director Antoine Fuqua to take the helm of their long-awaited Scarface remake, once again. The filmmaker had previously been attached to direct, but he backed out in late January over scheduling conflicts with The Equalizer 2. Ironically, Diego Luna had been attached to star at the same time as Fuqua was leaving, and now the actor's involvement is uncertain, since the changing production timeline may result in scheduling conflicts for the actor. Last February, Universal Pictures set an August 10, 2018 release date, while bringing in the Coen Brothers to rewrite the script. We reported in May that Suicide Squad and Bright director David Ayer was in talks to take the helm, but we reported in July that he has backed away from the project due to creative differences. David Ayer's exit from the project was the last update we had until now, with this latest report revealing that Universal has dropped the summer 2018 date as the studio looks to put this long-gestating project together once again. This remake will be set in contemporary Los Angeles, continuing the tradition of each new Scarface movie being set in a different city. The original 1932 Scarface movie, directed by Howard Hawks, starred Paul Muni as Chicago gangster Tony Camonte. The 1983 remake, directed by Brian De Palma from a script by Oliver Stone, followed Cuban immigrant Tony Montana and his rise through the criminal underworld in Miami. No details have been given for the title character in this new installment quite yet, and there is no indication as to when production may start, or when the studio may be eyeing this project for release. 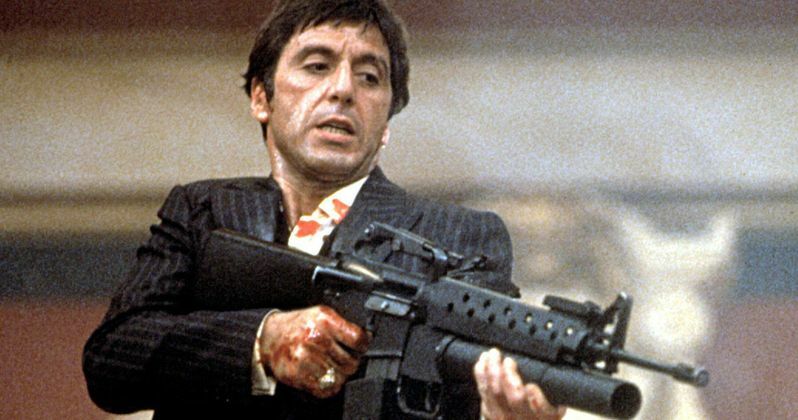 The development on this Scarface remake actually goes back a number of years, with David Ayer coming aboard in 2011 to write the script, before Paul Attanasio (Quiz Show, Donnie Brasco) took over writing duties in 2012. David Yates (Fantastic Beasts and Where to Find Them) was attached to direct in 2013, with Pablo Larrain (No) set to take the helm in 2014 and Jonathan Herman (Straight Outta Compton) coming aboard in 2015 to write the script. The latest version of the script is from Herman, Ayer and the Coen Brothers, but it's unclear if another writer will come aboard and re-work the script for Antoine Fuqua. Dylan Clark (War For the Planet of the Apes) is producing through his Dylan Clark Productions company alongside Marty Bregman, who produced the 1983 Scarfacemovie, with Scott Stuber serving as an executive producer. This report from Deadline states that Fuqua met with Universal studio brass this week, and that the prospects for this project look "strong," although there is still a long road ahead before this project gets off the ground. Antoine Fuqua's The Equalizer 2 is slated for release on July 20. He is also attached to direct and produce the TV series Omerta, based on Mario Puzo's final novel, which has Sylvester Stallone attached to star, although there have been no updates on that project in some time.